I woke up feeling refreshed and rested after yesterday’s zero. Town time always goes by faster than I’d like, but I felt good about all that got done. I was up at 6:15am this morning and rewarded myself with some more of Greys. It would have to take time to buffer from time to time with the clogged hotel wifi, but it was glorious to just lounge in bed for an hour and watch some. It’s Mother’s Day and I got to Skype with my sister and nephews and then the family I nanny. I do want to give a shout out to my mom for Mother’s Day even though she won’t see this for another week…Happy Mother’s Day Mom!!! 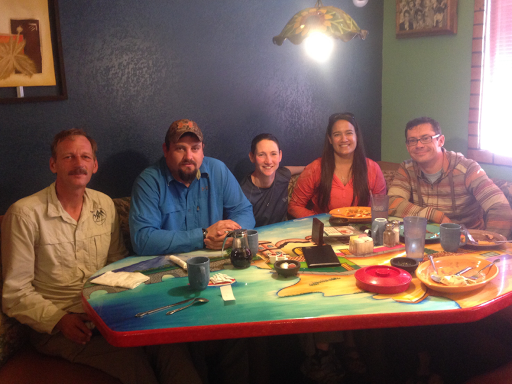 We didn’t need to leave for the trail until 10am, so I had breakfast with Sirena, Greyhound, Josh(who I met last nigh) and Li. I really enjoyed getting to know this group. Greyhound and Josh are both Army vets. In July, Greyhound and another hiker I admire (Chris “Wolverine” Hiller) will be working with the Warrior Hike program to test run a trip down the Mississippi from Wisconsin(I think?) to New Orleans. They will be going in a specially custom made hybrid kayak/canoe that is intended to eventually be used by a disabled veteran that cannot physically hike a long trail. The goal being that the Warrior Hike program will be able to provide an alternate “thru” experience to disabled veterans that would not be able to hike. Really cool to hear that’s in the works and I encourage anyone interested to look up the Warrior Hike program and also Chris “Wolverine” Hiller’s website. I expect that he will be blogging about it. I also got to visit more with Sirena and that was a great boost to the spirits. 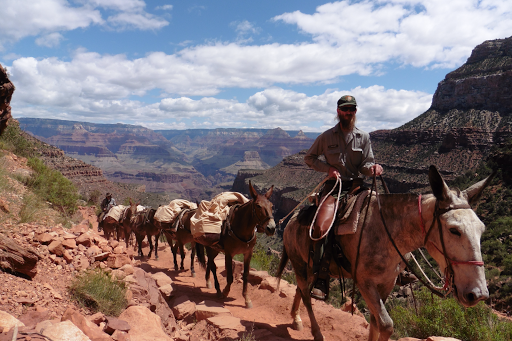 She absolutely loves the Grand Canyon, and as I mentioned yesterday, is the Gateway Community Liaison for the Arizona Trail Association. To elaborate more on what she’s done, she had section hiked the Arizona Trail many years ago, and last year, thru hiked it while raising money for the AZT. As she hiked, she had social events, speaking engagements, and invited anyone and everyone to hike as much or as little of the trail with her. Sirena also has a blog you can look up for more information. The hike last year ended up raising $18,000 for the AZT and there has been quite a bump in the number of AZTers this year. It was an inspiring breakfast all around! Li drove me and Gavin back into the Grand Canyon Village, to the Backcountry Office, where I left off on the alternate through the village that leads to the trailhead. 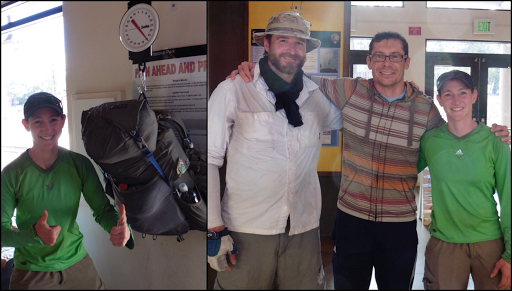 While there, we got to weigh our packs, which are filled with 9 full days of food and two liters of water. Mine was 40lbs and Gavin’s was 52lbs. Not bad! I was actually surprised mine wasn’t heavier with all the food I have in there. I can say I won’t miss these long carries once this hike is over. I had said the other day that I’d show you one of Li’s maps so you can see the route we are taking. 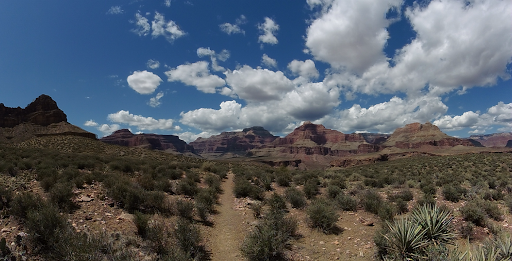 I knew nothing about the Grand Canyon, and seeing this really helped me to visualize what was going on. Again, the red is the official route and the purple are the alternates. Many may know this, but for those that don’t, here’s what you’re looking at. We hiked into the village from the east along the Tonto Trail (in red) on the original Hayduke route. 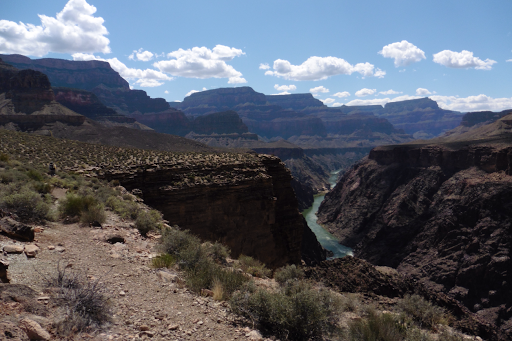 The original route crosses the Colorado River near Phantom Ranch by hiking north (down to the river) on the S Kaibab Tr. After the crossing, the trail then hikes up to the rim and ends up on roads for a bit. 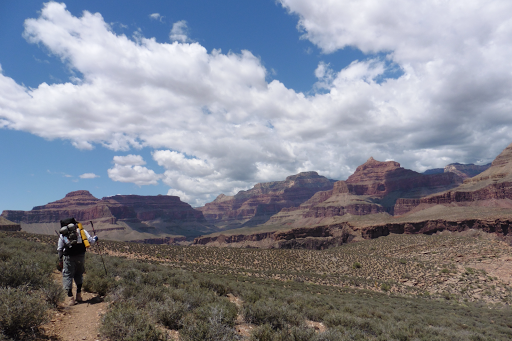 The route we chose is 30+mi longer, but takes us on a more scenic route and we get to go through Grand Canyon Village and the Bright Angel trial. Both the S Kaibab and Bright Angel trails are known as the corridor trails and these two are used for what people popularly call “Rim to River” or “Rim to Rim” trips where hikers dive down on one trail about 5,000ft from the rim to the river and then go back up the other. We are doing the Tonto West-Bass Trails Alternate. It will parallel the Colorado as we continue for a couple days along the serene and scenic Tonto Shelf before crossing the river by hitching again. 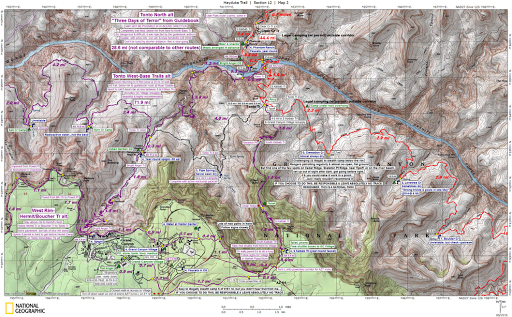 The original route is 27mi shorter with a 25mi road walk. I figured while I’m here, I may as well hike as much as I can in the scenic parts, even if it is two days longer. Today, Wyoming and Freebird are doing the Hermit Boucher Tr Alt and Katherine has chosen to attempt the Three Days of Terror Alternate. I just thought this would help people to visualize what’s happening…and also be a great example to show Li’s awesome maps and GPS tracks! 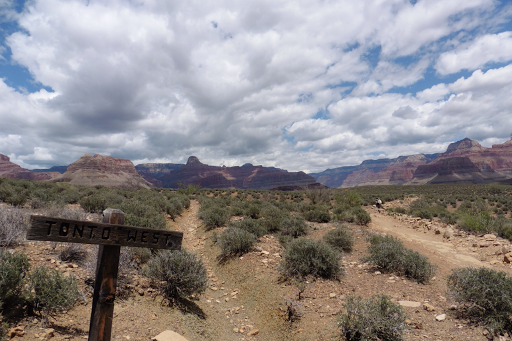 So, as for hiking today, we descended the smooth, wide, and gradual Bright Angel Trail. There were many tourists on this popular trail and it is usually the one people go up when completing the rim to rim hikes. I was actually getting emotional seeing all the eager and exhausted hikers of all ages make it to the top as I was hiking downward toward them. It reminded me of marathons and the people who finish with such gut, focus, intensity, joy, and pride. Fun to see! We flew down and it was a great day! Notice Gavin on the trail on the right. We both saw that sign and didn’t realize that it was indicating that the trail was forking off. Notice the seemingly obvious trail we both breezed by unknowingly, and I even took a photo of it! Less than 15mins later, we noticed the mistake and turned around. Ugh… So after our detour, we were finally on the Tonto West Shelf. Just like the east side, we are pretty level and cruising as we wound further away from the river, canyons, and pouroffs with some Colorado River sightings from time to time. 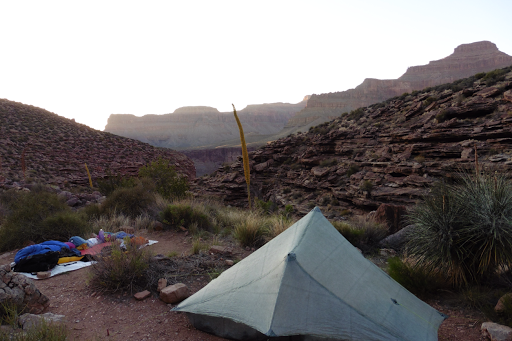 We got to our assigned campsite, Cedar Spring well early about 5:30pm and man as it exposed and hot. 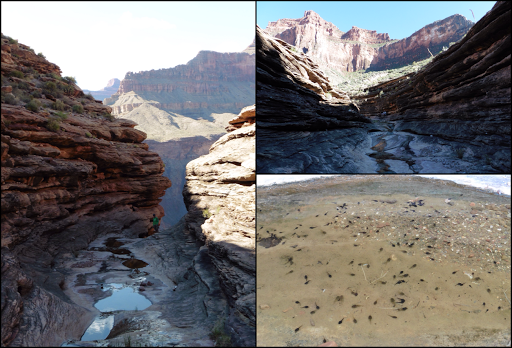 Fortunately, down the side canyon was a long pour off where we found some trickles of water and small pools(full of tadpoles to get water). We hung out in there, ate dinner, and got water while we waited to set up camp after the sun went behind the hills. Looking off the pouroff to the other side of the river, we could see across to the shelf Katherine should be hiking tomorrow. It was a nice relaxed start to such a long and sometimes challenging leg. Tomorrow should be a full day of Tonto West cruising. Again, I got to listen to more of the book, We Are Not Ourselves. The weather is mostly clear and getting hotter. It will be in the upper 80s this week, which is a bit warmer than last week, but still is nothing on the heat meter of the Grand Canyon. It’s warm and I used the umbrella to block the more intense heat for part of the day, but we are still very lucky it isn’t worse! It’s cooled now and is nice sleeping weather. 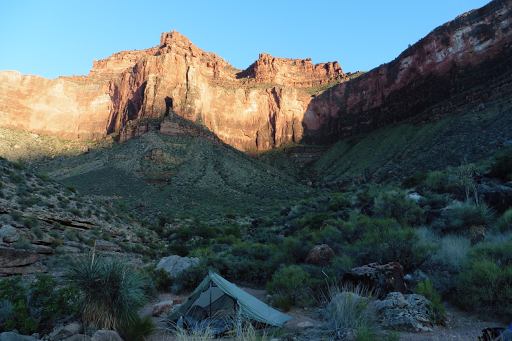 Again, a great campsite with a wonderful view!